Virtual LANs (VLANs) are used widely in modern network infrastructures. A VLAN can divide a physical LAN into small pieces of virtual LAN to contain broadcast traffic in a limited, reasonable range. In technical terms, it breaks the network into different broadcast domains. All hosts in a switched network are required to listen and supply resources to process broadcast messages, even when they are not the target. Decreasing the frequency of broadcast messages by breaking the network into domains can avoid wasting host CPU power. Also, limiting the broadcast can prevent switches from wasting bandwidth to forward messages to unnecessary ports. Finally, because hosts in different VLANs cannot communicate with each other directly, VLAN can also provide security. A host can be assigned to any VLAN regardless of geographic location, as long as the switches are connected by trunk links. VLANs need to be created on all switches on the path through which VLAN traffic passes. 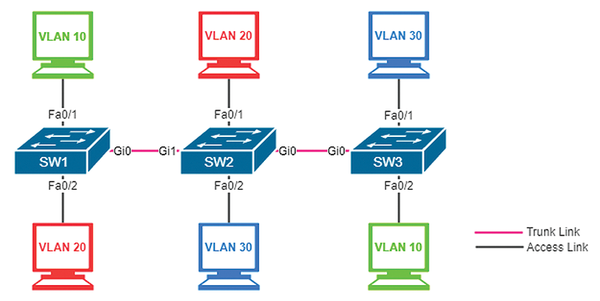 For example, in Figure 1 (see also Listing 1 for the configuration commands), VLAN20 needs to be created on SW1 and SW2 for red hosts to communicate, whereas VLAN 30 must be on SW2 and SW3 for the blue hosts to communicate. If you want the green hosts to communicate, all three switches would need VLAN10. Figure 1: A VLAN can be distributed on any switch across the entire network. command verifies the settings (Listing 2). The VLAN information shown in the listing is also called the VLAN database. Besides the three VLANs that were just added manually, VLANs 1002 to 1005 are reserved for system usage. VLAN1 is the default VLAN, to which all ports are assigned if no configuration is made. By default, only VLAN2 to VLAN1001 are available for custom use. The VLAN configuration is stored in a file named vlan.dat located in flash memory (Listing 3) instead of in the running configuration file (unless you are using transparent mode or off mode , which I address in a later section). Even if the running configuration file is erased, the VLAN information exists until you delete the vlan.dat file. Imagine you have more than 100 switches in your network. Every time a new VLAN is created, you will need to find the path through which VLAN traffic passes, so you can create the VLAN in the right switches. You also need to consider redundant paths, because the topology might change from time to time. This scenario is definitely a nightmare. Practically, VLANs are created on all switches to make sure they all can forward the traffic. Logging in to every switch individually to create or remove a VLAN is not fun. The VLAN Trunking Protocol (VTP) helps simplify such a boring and repetitive job. With VTP, you only need to manage the VLAN database at the VTP server; then, the VTP server propagates the VLAN information to all other VTP switches in the same VTP domain by using VTP update messages. For security reasons, the VTP password is also needed for a switch to join a VTP domain if a password has been set. The basic VTP configuration shown in Listing 4 should be placed on all switches in the same VTP domain. VTPs have four operating modes – server, client, transparent, and off – each of which behaves differently with local VLAN database modifications and VTP update messages. Table 1 summarizes the operating modes. *Only version 3 supports VTP off mode. Figure 2: SW1 to SW6 are in the same VTP domain but have different VTP operational modes. The switch will receive and check the revision number of the VTP update. As in server mode, client mode updates its own database only if the configuration revision number is larger than its own. You might be surprised to learn that a client also can generate a VTP update to other switches, just like a server. According to Cisco documentation , the only difference between a server and a client is the ability to modify the VLAN database locally. In Figure 2, SW3 is a VTP client. It receives VTP update messages from SW4, accepts and updates its database, and propagates the VTP update to SW2. At first sight, an OpenStack installation might seem like rocket science, but you can launch a fully functional cloud environment with minimal effort in a relatively short time with the Packstack automation tool. Microsoft provides some interesting virtualization features in current and future versions of Windows Server. You can connect or isolate virtual machines, and Windows Server 2016 even supports virtual switches.